Come on by and visit our booth for the Encnintas Trails Coalition. Should be a fun day. If you would like to socialize please arrive 15 minutes early. 1061 Double LL Ranch Rd. It’s the first meeting of 2019! If you would like to socialize please come 15 minutes early. Meet with City of Encinitas Parks personnel in the Carnation Room. Come 15 minutes early for socializing. See you there! Lot’s of fun and goodies at the Olivenhain Town Hall. Come by and visit. 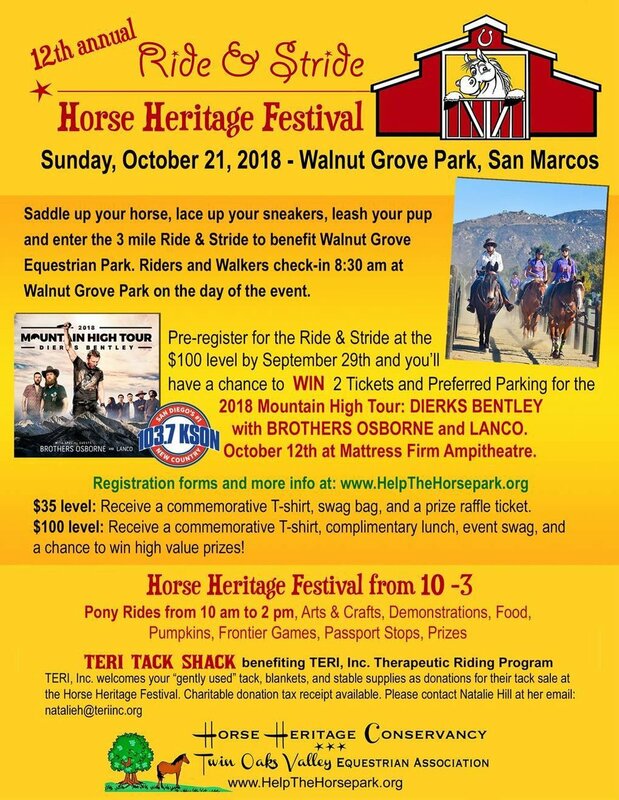 Join this 3 mile Ride & Stride to benefit Walnut Grove Equestrian Park. Walkers and riders check in at 8:30 am. This is our meeting with The Encinitas Parks and Recreation department. 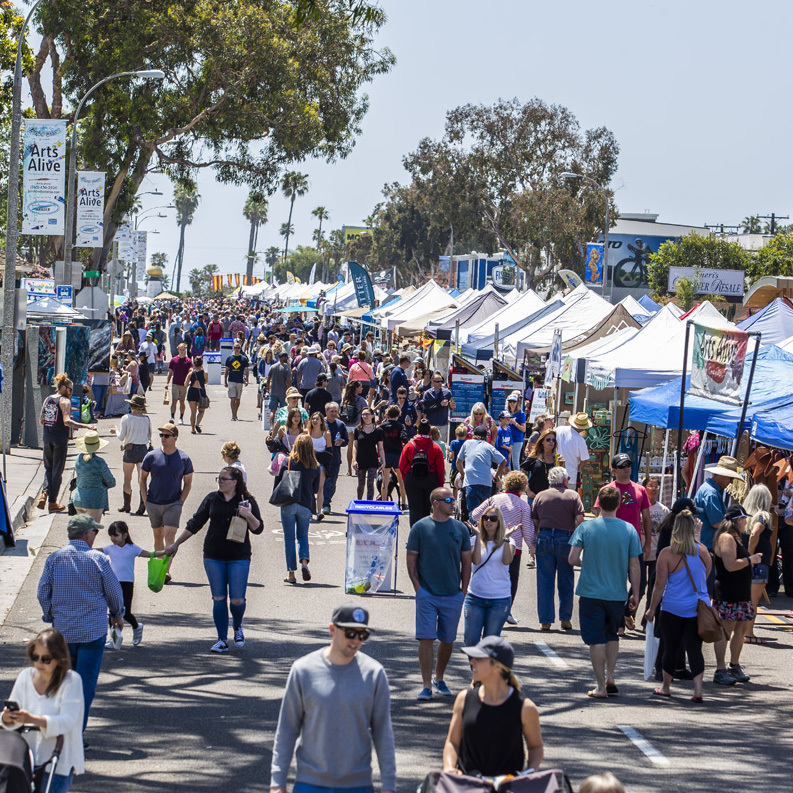 We will be at the Encinitas Street Fair! Saturday April 28, 2018. Come by and visit us at Booth 1005. We will have membership applications and trail maps. We are partnering with Tiger Tail who is providing dog and horse treats. We are looking forward to this event as is should be a fun day for all. Presented by the Department of San Diego Animal Services and hosted by the Olivenhain Town Council, Encinitas Trails Coalition and San Dieguito Riders. Special guest, Joe Mosca, Encinitas City Council Member and Deputy Mayor. Please join us for this community forum as we facilitate a positive dialog between agencies, organizations and the community regarding fire emergency lessons learned, preparedness and effective reaction. THE TRAILS COALITION WITH THE CITY OF ENCINITAS WOULD LIKE TO RECOGNIZE ELLIE TROESTER ON THIS DAY. WE WILL GATHER AT THE BRIDGE BETWEEN LONE JACK RD AND CAMINO DEL NORTE FOR A BRIEF DEDICATION. ELLIE WAS INSTRUMENTAL IN THE DEVELOPMENT OF THIS BRIDGE AND FROM THIS DAY FORWARD THE BRIDGE WILL BE KNOWN AS "ELLIE'S BRIDGE". We are co-sponsoring the upcoming Stallion Tour together with CTBA. This tour will include stops at Milky Way, Special T, Pacific Coast, BG & Ridgeley Farms. Tour must be paid in advance and Seats are going fast so please buy your tickets today. Don't miss out on this event! Temecula Pkwy/Hwy 79-S and head EAST. Go 6.6 miles to Anza Rd and turn left. Turn left at De Portola Rd (the first stop sign). driveway on the right, just past Casner Ranch. Follow the driveway down to the hay Barn area to park. Copyright (C) *|2011|* *|CTFMA|* All rights reserved. The meeting this month will be held at the DeMaster's residence. Visit our information booth at Olivenhain Town Meeting Hall. We will be raising funds by selling baked goods and trail maps! See you there! !